Tsubasa Onishi - Extra Wide Offstring Yo-Yo! 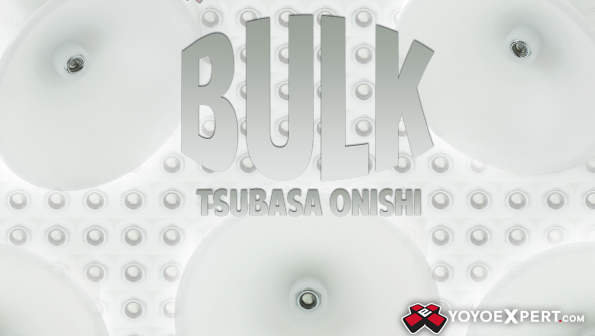 The Bulk is the signature yo-yo of two time 4A World Yo-Yo Champion Tsubasa Onishi! Just from hearing the name, Bulk, you know this is going to be a big yo-yo. And if the pictures don't do it justice, just look at the stats - At 72mm the Bulk is one of the widest offstring yo-yos around! This extra wide profile is exactly what Tsubasa Onishi wanted in his signature yo-yo. It provides such a huge catch zone that those risky 4A whips and orbits will be your new favorite tricks! Such a wide yo-yo may be looked at skeptically, but the perfectly balanced weight distribution of the Bulk gives you plenty of stability and spin time without sacrificing any maneuverability. The Bulk is precision machined in Japan from POM to give it a really clean look and a nice smooth grind finish. It features a unique adjustable gap and comes with extra spacers and o-rings so it can be completely customized to fit your style. Designed by a World Champion, machined in Japan, and a unique design - The Bulk is everything you have been looking for in your next offstring yo-yo!